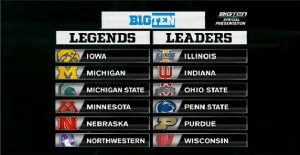 The New Big Ten Divisions for 2011. The Big Ten expansion to twelve teams and two divisions will set the stage for more intense coaching rivalries as Division races settle into place and the terrain becomes more familiar. The Big Ten race slid into unknown territory as the teams realigned and faced new scheduling rigors. Obviously, greater emphasis will be placed on intra-divisional contests. For example, it’s more important—in terms of the Big Ten race—for new coach Kevin Wilson and his Hoosiers to defeat Purdue than it does for Indiana to defeat Kirk Ferentz’s Hawkeyes since Iowa plays in another division. How this all plays out is yet to be seen, but there will undoubtedly be familiar rivalries lighting up Saturday afternoons with new faces leading the troops on the sidelines. It will be an exciting new beginning for all Big Ten football teams and their fans. Illinois-Ron Zook; Indiana-Kevin Wilson; Ohio State-Jim Tressel; Penn State-Joe Paterno; Purdue-Danny Hope; Wisconsin-Bret Bielema. This is the first time since 1993 that the Big Ten has enlarged its line-up. Each Big Ten team plays eight conference contests which includes every team in their respective division, plus three conference games outside their division called crossover contests. In total, every Big Ten team plays twelve regular season games beginning on September 3, 2011. Big Ten football division play concludes with the Big Ten Championship game on December 3, 2011, in Indianapolis at Lucas Oil Stadium. A true Big Ten champion will be crowned with the best in each Division vying for the title.